Besides producing delicious and nutritious food, open-pollinated and heirloom seed is the front line in the fight to protect genetic diversity. The continued planting and harvesting of these seeds is vital to maintaining a safe, secure and independent food supply. Spring is always just around the corner, so now is the perfect time to order interesting and unique heirloom seeds to for your garden. It could be the harvest that lasts for generations. Amishland Heirloom Seeds Specializes in rare varieties grown since the 1700’s in central Pennsylvania. Annie’s Heirloom Seeds Only heirloom seeds – no hybrids – family owned and operated. Baker Creek Heirloom Seeds Offers only non-GMO, open-pollinated seeds. Botanical Interests Let us inspire and educate the gardener in you. Companion Plants Common and exotic live herbs and seeds. The Cottage Gardener Preserving the past, protecting the future. Denali Seed Company Best seed varieties for gardening in cool climate areas. Fedco Seeds Untreated co-op seed packets. Filaree Farm Offers over 100 unique strains of seed garlic. Fruition Seeds Customizing organic seed for the Northeast. Heirloom Organics 100% Non-hybrid & non-GMO. Packaged for long-term storage. Heirloom Seeds Growing a taste of yesterday … today. High Mowing Organic Seeds Independently owned, farm-based organic seed provider. Irish Eyes Garden Seeds Offering large selection for short season climates. Johnny’s Selected Seeds Vegetables, fruits, flowers, herbs, cover crops, farm seeds. Kitchen Garden Seeds Helping cultivate the most abundant gardens. Living Seed Company Grow great food and save your seed. My Patriot Supply Emergency preparedness, self reliance, food independence. NE Seed Good Seed, Glad Harvest. The Natural Gardening Company Oldest certified organic nursery in the U.S.
Prairie Road Organic Seed Recognizing we are PART OF nature, not APART FROM IT. Potato Garden Certified seed potatoes from the U.S. and around the world. Sand Hill Preservation Center Genetic preservationists – heirloom seeds & poultry. Seed Savers Exchange A non-profit organization dedicated to saving & sharing heirloom seeds. Seed Wise Non-GMO seeds directly from the grower. Seeds of Change Goodness from the ground up. Certified organic. Select Seeds Rare. Heirloom. Choice. Southern Exposure Seed Exchange Specializing in open-pollinated varieties developed before 1940. Sow True Seed Open-pollinated, non-hybrid and GMO-free vegetable, herb, flower and cover crop seed. Strictly Medicinal Seeds Website contains handy Common-to-Latin and Latin-to-Common reference pages. Sustainable Seed Company Organic, U.S. grown open-pollinated seed. Seeds include ancient grains. Territorial Seed Company Protecting our genetic foundation for future generations. Terroir Seeds Offering heirloom vegetable, herb and flower seeds for home gardeners and small growers. Thomas Jefferson Seeds Monticello heirloom seeds. Turtle Tree Seed A non-profit seed company that sells 100% open-pollinated vegetable, herb and flower seeds. Vegetable Seed Warehouse Untreated heirloom vegetable seeds. Victory Seed Company Rare, open-pollinated and heirloom garden seeds. White Harvest Seed Company Offering a diverse variety of heirloom vegetable seeds. Wild Boar Farms Changing the world one tomato at a time. Author Una McGovern turns back the pages of time to remind readers of half-forgotten skills that were once as ubiquitous as the smartphone. Before the industrial revolution, every household had their own cider maker, beekeeper, rope maker, basket weaver, candle maker and much more. These abilities were not just the result of years of learning but also the result of careful observation of the natural world. They made families self-sufficient and in a hostile world this knowledge was often the difference between surviving or not. The skill of coppicing, for example, is an ancient method of woodland management that intentionally produces material that will later be used for house building, making charcoal, basketry, brooms as well other things important to the function and comfort of the household. Like most of the skills in this book, coppicing is not instant gratification. And, it also requires the craftsman to work in tune with nature. When a broad-leaved tree is cut down, if the stump and roots are left intact, the tree will coppice. This means the tree will put its energy into regrowing by sending out new shoots. When the shoots reach the correct size for their intended purpose (which could be years) they are harvested and the process starts over. A practice similar to coppicing is called pollarding. Instead of cutting the tree at the ground, the tree is cut about eight feet up. Because the resulting shoots grow above the grazing level of animals, it is a useful method of growing firewood in an area that is also used as pasture. Lost Crafts is filled with practical, simple knowledge that enabled former generations to live in harmony with nature and themselves. In a time where the ability to “work with one’s hands” is once again re-gaining the respect it deserves, this book opens a door. McGovern reminds us that even in a modern world, the ability to make a fire without a match, fish with creel, skin a rabbit, forage for wild food, and navigate by the stars are still very valuable skills to have. June is dairy month and the perfect time to highlight just a few of the many endangered breeds of dairy cattle. Like the loss of genetic plant diversity, the decline in livestock diversity also threatens the safety and security of the world food system. Selected because of their high milk production, black and white Holsteins today make up over 90% of America’s dairy herd. But unlike most historic breeds that can thrive in poor pasture conditions, Holsteins require large amounts of feed and high levels of grain. The genetic make-up of historic breeds creates animals that are productive into their teens, compared with only six years of milk and calf production for Holsteins. Fine-tuned by nature over centuries, several historic breeds of cattle such as Canadienne, Kerry and Randall Lineback are currently listed as critically endangered by The Livestock Conservancy. Brought to Canada between 1601-1660 and descended from Normandy and Brittany cattle, Canadienne are prized for their superior ability to produce milk on poor forage. These cattle are extremely hardy and have superior environmental adaptation. Milk ­production averages about 15,000 pounds per lactation, with about 4.35% butterfat and 3.7% protein. Imported to the U.S. in 1818, Kerry cattle are descended from Celtic cattle that roamed the landscape when Caesar invaded Britain. Kerry cows are known for being robust mothers that calve easily and for making milk that more easily digests due to smaller butterfat globules. This breed’s ability to thrive in the meager environment of the remote regions of Ireland made them an important asset to poor farmers. 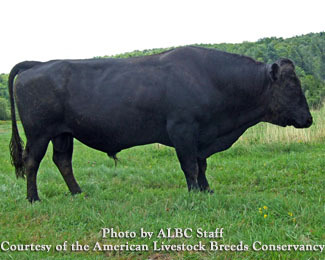 Likely to have originated in New England from a combination of Dutch, English and French cattle, Randall Lineback became an integral part of New England rural life. They were used for dairy, beef and oxen for several centuries. 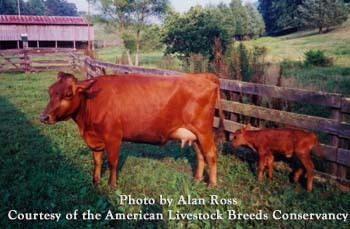 Randall Lineback genetics have been lost in the past century due to crossbreeding with Holsteins. Fewer than 150 of these animals remain. 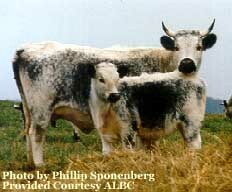 For more information on these and other rare and endangered dairy breeds visit TLC Conservation Priority List. The Livestock Conservancy is a clearing-house for information on livestock and genetic diversity; and the only organization in the U.S. working to conserve historic and rare breeds of livestock. The ancients believed that with an anvil, a hammer and a strong fire a blacksmith could make everything he needed. After that, he could make everything anyone else needed. It’s no wonder that an art which forged nations is experiencing a renewed interest around the globe. At Sanborn Mills Farm in Loudon, New Hampshire, students come to learn this and other traditional skills that were once central to every thriving community. While the idea of forcing iron to submit to your will may seem daunting, “If you can hammer a nail, you can get started blacksmithing.” says Colin Cabot, farmer, conservationist, preservationist and entrepreneur. Some of the things students will learn during the three-day workshop for beginners is safety, respect for the art, fire management, air handling, how to find the hottest part of the fire and how to “read” what is going on with the metal by judging its color. Beginning blacksmiths will use the techniques of drawing and tapering to create a gate hook. And they will learn the important secret of making multiples of the same item. “Learning to forge metal is a linear progression of skills.” says Cabot. Individuals taking the intermediate workshop can expect to further develop their basic skills while moving onto finer work such as hardening steel for tools and knives. 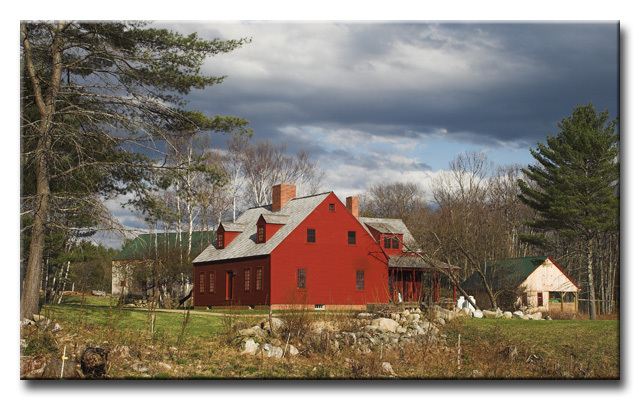 Sanborn Mills Farm is a traditional New England diversified working farm with agricultural fields and managed forests. The timber-framed barns and outbuildings are used for animals. 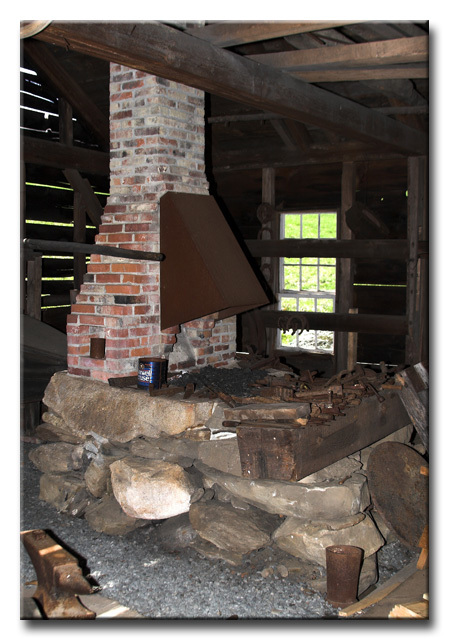 Dating from the 1830s, the water-powered sawmill and grist mill, and blacksmith shop still serve their original purpose. The farm buildings are clustered around two dams at the outlet of Sanborn Pond. At one time, the farm was a bustling center of agricultural activities that supported an extended family and served the surrounding community. Today, Colin and Paula Cabot have gathered farmers, craftspeople and historians to teach traditional skills. They provide opportunities for people to learn old-fashioned ways and explore how this knowledge can be integrated into modern life. Colin and Paula believe these skills are a vital connection to the land and continue to be important and relevant in our time. Surrounded by almost 2,000 acres of open space held in conservation, Sanborn Mills Farm serves as a meeting place where current needs for sustainability and community are forged with the skills and knowledge of the past. The 1,098 pages of Facts for Farmers are filled with illustrations, graphs, charts and detailed instruction on everything from managing apple orchards to making whitewash. Interwoven are commonsense tips and practical bits of wisdom on the topic of getting along with nature. Robinson upholds the notion that part of what one earns from life as a farmer is contentment, self-respect and personal freedom. In Robinson’s day you didn’t need much more than a strong back, a patch of ground and an earnest measure of patience with which to await the miracles of Mother Nature—the same is still pretty much true today. From time to time, RLJ will revisit the writings of Robinson to share ideas that are as useful today as they were years ago.